Copyright 2010, Olivia Bautista Sparks. Used with permission. Online tutorials provide an alternative to in-person or in-class library instruction and can be indispensable for reaching large student bodies, especially when combined with existing web-based guides, i.e. LibGuides, and course management resources, i.e. Blackboard. Unfortunately, professional-looking tutorials take time, money and expertise to develop; these are commodities that our underfunded and understaffed libraries may not have available. Recently developed screencasting services make online tutorial creation both free and easily done by science and engineering librarians. Online tutorials are used to introduce information to classes with large groups of undergraduate students (Scaramozzino 2008) and distance learning students (Blake 2009). The cost of creating tutorials, however, may prohibit their development by those that need them the most, librarians in understaffed libraries, with large student bodies, or with many online courses to serve. Software must be purchased, staff must be trained in using the software, have knowledge of instructional design and multimedia guidelines, have time to develop, plan and execute the tutorials, and finally, there must be server space on which to store and access the tutorial files. Online tutorials need not be a daunting task, though. Screencasts could be your answer. Screencasts, video screen capture with audio narration, are not new (Meier 2007), but now they are more readily accessible, lower in cost, much easier to use (Farkas 2009; Kroski 2009; Rethlefsen 2009a; Slebodnik & Fraser Riehle 2009) and could be used to reach students, faculty and researchers. Create a brief virtual introduction for students, faculty and staff in your academic departments. This introduction can pave a way to new faculty and graduate students. Screencasts are also helpful when answering reference questions, especially when providing step-by-step instructions. Rather than sending a long e-mail with written instructions, try a screencast which incorporates both visual and audio cues. Tired of answering the same question repeatedly? Create a quick screencast that you can use to help many students and colleagues. Utilizing screencasting software is the best way to transform an in-person instruction session into an online learning module without learning the intricacies of more robust tutorial software. On-campus sections are offered each semester for our Chemistry and Society (CHM 108) class; this past semester, Fall 2009, an online section was offered by the same instructor. This instructor always included a library instruction session for the class and wanted both the on-campus and online students to receive the same information. For the online sections, the same instruction was provided by dividing the lecture and demonstrations into five screencasts in which each screencast included an activity that mirrored the hands-on activities used in the on-campus session. A web-based guide developed for the course included the screencasts and the activity. The instructor placed a link to the guide within the course's Blackboard site. The instructor was pleased with the result and consequently requested library instruction sessions for a newly developed upper division class and recommended library services to colleagues within the department. Library instruction sessions are now scheduled for upper division classes which have not been serviced previously by the library. Instruction sessions tend to gravitate towards the same weeks in the semester, leading to multiple instruction requests for the same day and time. Traditionally, the "first come, first served" policy has been used to determine which class gets the desired day/time and latecomers must reschedule or go without an instruction session for their class. With screencasting, the librarian can be in two or more places at once. When an instructor requested a library instruction for 10 classes during the same week in which five other instruction sessions had already been scheduled, screencasting was used to accommodate all 15 sessions during the preferred time. 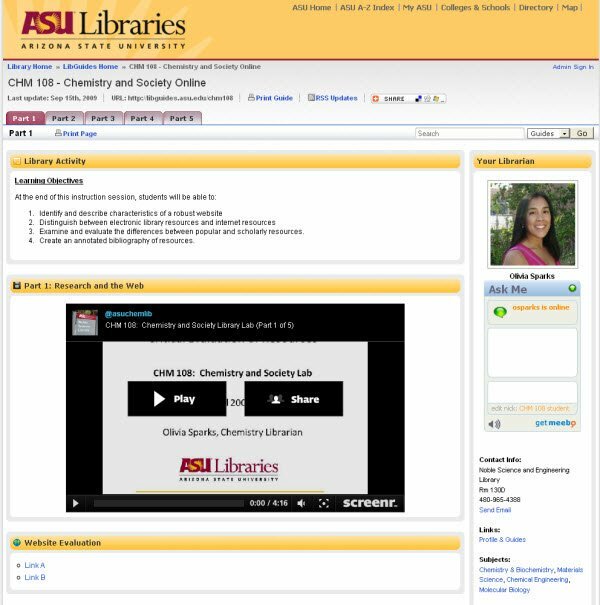 A library session was developed and embedded into the web-based course guide (http://libguides.asu.edu/content.php?pid=3454&sid=477724); a link to the guide was included in the course's Blackboard site. Although there was no face-to-face meeting, students could initiate contact with the librarian by the Meebo chat widget embedded in the guide. The screencast proved to be more reliable and easier to manage than sending narrated slide show via e-mail, a method tried in a previous semester. Does the software require installation or is it browser based? Browser based software is more convenient, especially for those working from multiple workstations. Typically, the software only requires an updated Java Plug-In. Client-loaded software can offer more features, such as screenshot, image editing and annotation tools. Does the software record audio during screen capture? One of the evaluated screencasting software did not automatically record audio; this must be selected prior to recording. However, this software allowed the option to add audio after you record the screencast. This is helpful to those who desire flexibility when creating a screencast. What types of files are created? AVI and MOV files are larger in size, but can be imported into video editing software packages. Flash (SWF and FLV) files are the most common. MP4 files are viewable on mobile devices and can capture and present in High Definition. Keep in mind that appropriate software (i.e., Flash Player and QuickTime) are required to view the videos. Does the software require a log in? For each of the evaluated software, an account must be created to save and host the screencast on the external server. A single log-in for your department or library can create a collaborative library of digital learning objects. The log-in for Screenr is tied to a Twitter account, so you can choose to promote your screencasts as they are developed. Most of the free software is limited to five minutes of recording time; although Screencast-O-Matic allows up to 15 minutes of recording time. Keep in mind that length of recording is proportional to file size. What are the options for video hosting? Can you save your files and host it on your own server? Are your hosted files in the public stream? By creating an account, you are able to host your files on an external server. For a few of the evaluated software, you are able to save a copy of your screencast to your computer either before or after publishing onto the external server. For most of the software options, posting your screencast on their external server means that you are also publishing your screencast in their live feed which is viewable and accessible to all. How accessible is the recording menu? Are you able to pause your recording? The recording menu can offer microphone levels check to verify that you are recording audio, a timer to let you know how much time has elapsed or how much time is left to record and the record/pause button. Some software also supports keyboard shortcuts in addition to the record/pause button. Pausing during a recording is helpful when you need to display different images during the recording. Every second is valuable commodity; without the pause feature, the time it takes to change the image or access a different database is recorded in the recording. Pausing eliminates any lag time in the recording and makes for a more professional appearance. Are you able to edit or annotate your recording? Are you able to upload your screencast to online video streaming sites (i.e., YouTube or Vimeo)? Annotations are the easiest method for captioning screencasts. If the screencasting software does not support annotations, YouTube provides annotations and captioning functionality. Annotations are important for making screencasts accessible to a wider audience. Consider uploading your screencasts to YouTube or Vimeo as a backup hosting site. After publishing, the software will provide you with a URL to your screencast. Often, this URL can be found on the screencast page. The shorter URLS are more convenient when sending via e-mail or posting to the course management site. Are the embed codes provided or easily accessible? Adding embedded tutorials into the web-based guides and course management site, i.e., Blackboard, creates an online classroom for the student. Some tools provide a variety of embedded sizing options for convenience. We selected Screenr for our use because of the very minimal learning curve, and no software installation is needed. Screenr's embed code is conveniently located on the published screencast page; and most importantly, there is the option to download the MP4 file or directly upload to YouTube after the screencast is published. When creating your screencasts, planning is a crucial key to the process. Kroski (2009) and Blake (2009) provide excellent step-by-step instructions to creating online tutorials using screencasts and Oud (2009) has created a checklist for incorporating multimedia guidelines into screencasts. Because there is no editing involved, the tutorial creation is done within a one-shot recording. Scripting and storyboarding, even for short tutorials, will better prepare you for the recording process and will produce a more polished product (Blake 2009; Kroski 2009; Slebodnik & Fraser Riehle 2009). Recording your trial runs will help establish your timing and you may be satisfied with the product within the first few attempts. There are two different approaches to the screencasting tutorial, the narrated slide show presentation or the recorded demonstration. Narrating a slide show gives you more control; you have predetermined what will be displayed on screen and you do not need to worry about slow loading times that can occur during live demonstrations. Slideshow software, such as PowerPoint, also gives you animation options for highlighting concepts on the screen. Although the creation of a slide show prior to the screencast recording is more time intensive, the elimination of slow screen loads and the additional animation options make it worthwhile. The recorded demonstration shows exactly what to expect when performing a search or task within a database. Once outlined, the recording process is usually quicker as you do not have to create screen shots beforehand; avoid recording when your internet connection is habitually slow. Most importantly, use the pause button whenever entering a password or other secure information. When working with multiple sections of a class and attendance is mandatory in the in-person class, consider creating a "private" web-based guide for the online sections. These guides are not published within the directory and are only accessible via direct URL. The URL can be shared with the faculty and appropriate students via e-mail or Blackboard. Incorporate the assessment of the guide and the screencasts through an embedded survey via Google Forms or Survey Monkey or through the completion of an assignment. With screencasting now more accessible, science and engineering librarians can use screencasts to not only create tutorials, but to promote library services, highlight collections and most importantly, reach out to faculty, students and researchers and bring the library into their learning space. The author would like to thank Jeanne Davidson and Lisa Kammerlocher for discussions on this topic and Linda Shackle for comments and suggestions on an earlier draft. Blake, L. 2009. On Campus or Out of Town. Computers in Libraries, 29(4):11. Farkas, M. 2009. Your Desktop: The Movie. American Libraries, 40(11):33. Kroski, E. 2009. That's Infotainment! School Library Journal, 55(2):40-42. Meier, J.J. 2007. Staying Afloat in a Flood of New Technologies. Issues in Science and Technology Librarianship. [Online]. Available: http://www.istl.org/07-summer/viewpoint.html [Accessed: January 11, 2010]. Oud, J. 2009. Guidelines for effective online instruction using multimedia screencasts. Reference Services Review, 37(2):164. Rethlefsen, M.L. 2009a. Product Pipeline. Library Journal, 134(1):S12-S14. Rethlefsen, M.L. 2009b. Screencast Like a Pro. Library Journal, 134(7):62-63. Scaramozzino, J.M. 2008.An Undergraduate Science Information Literacy Tutorial in a Web 2.0 World. Issues in Science and Technology Librarianship. [Online]Available: http://www.istl.org/08-fall/article3.html [Accessed: January 11, 2010]. Slebodnik, M. & Fraser Riehle, C. 2009. Creating Online Tutorials at Your Libraries: Software Choices and Practical Implications. Reference & User Services Quarterly, 49(1):33.